Over the past week, we have been overwhelmed with images and news stories about hundreds of thousands of desperate Syrian refugees pressing into Europe, overflowing borders and causing a major upheaval. Our hearts were broken as the devastating image of a Syrian child face down on the beach circulated through our social media feeds. And it's got us asking a lot of questions. Where have all these people come from? Why are they on the move? What is their future? And, burning at the front of all our minds, what can I do about it? Let’s start with the basics. Where is Syria & what was it like before the war? The nation of Syria is located in the Middle East, bordering Turkey, Iraq, Lebanon, Israel, and Jordan. Its total population in 2011 was 22 million people. Syria has a rich history of civilization dating back 10,000 years and spanning the Egyptian, Persian, and Roman empires. Filled with ancient architecture like Roman ruins and European castles, Syria is home to diverse ethnic groups and religions, including different denominations of Muslims, Christians, and Jews. Syria also has a strong tradition in the arts creating beautiful poetry, short stories, and films. The culture was known for their fragrant, central marketplaces filled with spices and rich fabrics, complex foods, and love for sweet desserts. People in Syria regularly achieved university education and went on to successful professions like doctors and investment bankers. They lived in comfortable homes, picnicked with relatives, and owned smartphones. What started the war in Syria? Tragically, in the "Arab Spring" of 2011 protests against the Syrian government and President Bashar al-Assad triggered a protracted four year civil conflict that continues to rage today. Countless homes have been destroyed, businesses abandoned, and hundreds of thousands of people killed. Marketplaces have become war zones and education has all but stopped. To read an in depth analysis of how the war came about and what the issues are, check out this article in The Atlantic. How many refugees are there & where are they going? As a result of the war, 12 million people in Syria have been displaced (that’s over half the country’s population!). 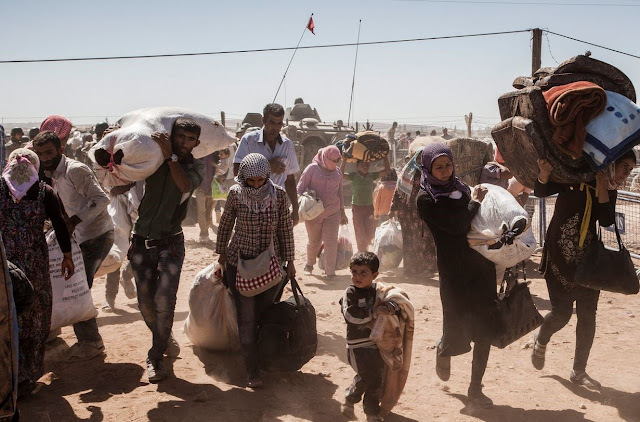 Almost eight million of those people have stayed inside Syria, but over four million of them have fled to the neighbouring countries of Turkey, Lebanon, Jordan, Iraq, and Egypt. In recent weeks, a new wave of Syrian refugees has been attempting to reach affluent European Union (EU) countries by traveling overland through Turkey into Europe. Others are making the treacherous journey in boats over the Mediterranean sea, usually landing in Greece. Clashes have erupted between refugees and the military on the borders of Serbia, Austria, and Hungary because refugees have to traverse those nations to get to wealthier EU countries like France, Germany, and the UK. Unprepared for this influx of desperate humanity, Europe is also being plunged into crisis. Doesn’t the UN take care of refugees? Well yes, and no. 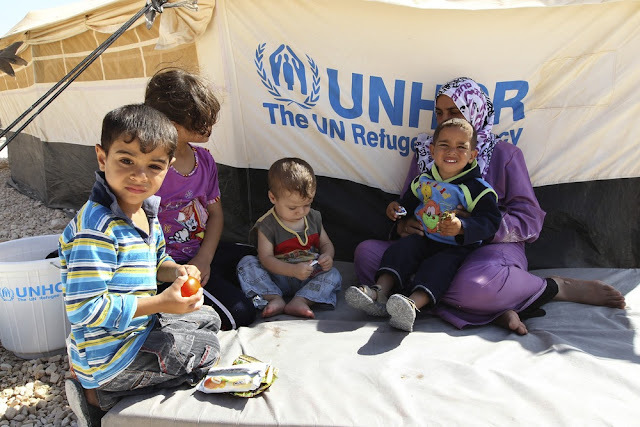 The UN Refugee Agency (UNHCR) helps host countries, like Turkey and Iraq, set up refugee camps and secure food, water, and protection. The UN World Food Programme often provides basic staples like rice or wheat. But the UN does not have the capacity to bear the weight of the 59.5 million displaced people in the world. It’s up to the host countries' governments to help care for the refugees within their borders, and often, they don't have the resources. Many Syrian refugees are not in UN camps because there simply is not enough room, or because they chose to try and get jobs in foreign cities and integrate into a new society instead. But life for refugees outside camps is often precarious. What is Food for the Hungry (FH) Canada doing to help Syrian refugees? FH Canada has focused its relief efforts with the Syrian refugees in northern Iraq. In March, FH delievered a 40 foot container of medical supplies to aid internally displaced people (IDPs) and refugees in Iraq. At this very moment, another container filled with 1 million servings of soup is on its way to feed hungry Syrians outside refugee camps in northern Iraq. FH is working closely with the Kurdish government and a locally-based NGO to ensure distribution and use of this aid goes to those who need it most. If funds are provided, FH plans to send more containers of urgently needed medical relief and food aid this year. FH Canada would love for you to partner with them by helping fund containers of medical and food relief for desperate Syrian refugees who have fled to northern Iraq. Many Syrian refugees still lack access to food, clean water, winter clothing, and basic medical care. With your gifts, FH can help care for tens of thousands of families.